Still in the middle of home improvement. But the bathroom looks WAY better than it used to. It’s almost done. 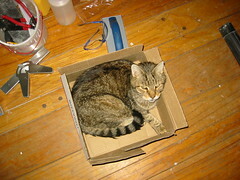 Here’s a tile box, that Dos, our cat, adopted as his. Everything is going well. Still planning for Rob’s big 40th B Day celebration on April 2nd and Family visiting from Michigan during that week.